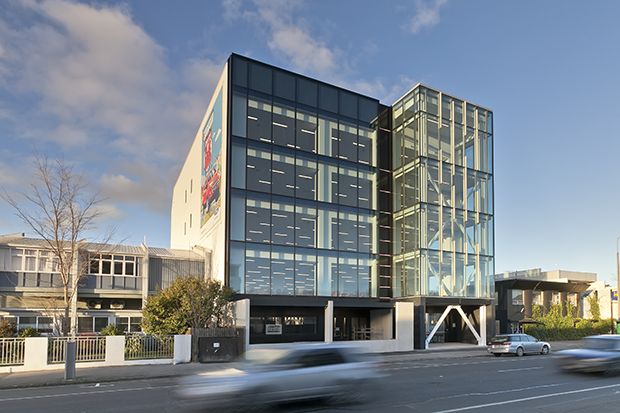 Christchurch, 13 August 2014 – 104 Victoria Street, a fully leased five storey office building redevelopment, has come up for sale. Selling on behalf of Countrywide Property Trust, 104 Victoria Street is being marketed by Mark Macauley, Managing Director of CBRE Christchurch and his colleague Sam Staite and is available for sale by fixed price, with the returns of more than $1.3 million a year in rent. The property occupies a net lettable area of approximately 3,473sqm with typical floor plates of 676sqm. The building has a double street entry off Victoria Street and Montreal Street and located on the northern side of the Christchurch CBD in a thriving retail and office location. During the refurbishment 104 Victoria Street was stripped back to the frame, had the floor plates extended and exterior reclad with a new glass façade which menat it is 100% NBS rating. The building is five levels with four floors of office accommodation tenanted by California-based logistics software company Telogis and the ground floor a Tony Astle restaurant and boutique gym. All levels are presented beautifully with natural light and stunning views, offices are fitted with an energy efficient LED lighting system with sensors which are a key feature for tenants’ overall operating costs. Mr Macauley says the high quality refurbishment, the long lease term, the buildings double street frontage and car parking are all reasons that CBRE are expecting high interest in 104 Victoria Street.